Bikers Fit Mens Motorbike Leather Jacket. BIKERS FIT MOTORBIKE LEATHER JACKET WITH CE CERTIFIED PROTECTIONS - INCLUDING SHOULDER & ELBOW METAL PROTECTIONS AND EXTRA PADDING ON CHEST/RIBS & BACK. 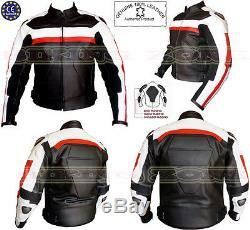 Product Details: Brand New Mens Bikers Fit Cowhide Leather Motorbike / Fashion Style Customised Jacket. Customer may ask for any changes in the jacket. It can be made as motorbike jacket with all protections or either fashion jacket without protectors. Customer can also order full suit for this style. · 100% genuine mild grain 1.1 1.2 mm cowhide leather. Original CE Approved protectors including metal protections and extra padding. Mash lining with removable protector pockets. Zippers to attach Jacket to the trousers · Original YKK zippers for durability. Additional padding for safety on critical parts · Any size as per customers body fittings. Customer can upgrade their order to Premium Cowhide Naked Leather with extra charges. Customers can also order any jacket or suit of their own design and we will make those designs for them, however, they will be charged according to the material and services we use. We will be happy to serve all your queries. To help for sizing, please see table below - The measurements structure of the size chart in the table is our company's own personalized. It could not be referred or compared to any other sizes such as UK, European, USA sizes etc. Please make sure that you take your exact body measurements and do not leave extra inches loose (except not to take too tight measurements) as we will add the extra inches ourselves accordingly. Imagine you adding inches and than us adding further inches, that will create chaos. We add extra inches to your body measurements according to your body structure, height and to maintain the jacket shape in order to achieve an outstanding fitting, flexibility and being able to wear any under garments or other. We also suggest you to take measurements on your skin or in your under garments to get accurate sizes. For Upper body you need to give us sizes of. Chest (A): Measure around the fullest part of your chest passing the tape loosely under your armpits. Measurement tape shouldnt be too loose or tight. Sleeve (B): Measure your sleeve from your shoulder to your wrist. Waist (C): Measure around your waist over your naval part. Suitable for person with chest size. For lower body you need to give us sizes of. Hips (D): Measure around the widest part of your hips. Thigh (E): Measure around the widest part of your thigh. Inside Leg (F): Measure from your crotch to ankle. Complete Height (G): Head to toe. The inside length can be altered according to your in-leg measurements. We make customized jackets and suits which means we will manufacture jackets and suits according to your exact size. These charts only show what measurements come under which sizes and it also helps customers to understand how much they have to pay if their sizes are 3XL or above. There will be extra charges for jackets and suits larger than 2XL i. Extra charges for jackets and suits larger than 4XL i. Extra charges for jackets and suits larger than 6XL i. The items made on order only are not stored in the warehouse. They are dispatched directly from the manufacturing unit overseas. Following additional information is needed for courier purposes. Contact Telephone Number (landline or mobile). Please note that we will not start production of anything unless we receive clear funds and complete sizes are confirmed with you. This is maximum time limit; you may receive your items quite earlier. However, this time may increase in case of deliveries to South America, Mexico, Russian Federation and Israel. So please customers from these countries give us a little bit extra time to get their items delivered to them. We have the right to refuse/cancel an order if the customer is not willing to co-operate. 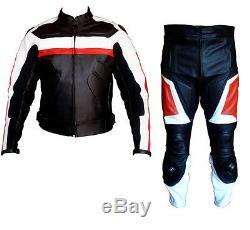 The item "BIKERS FIT MENS XTRA PROTECTION CE ARMOURS MOTORBIKE / MOTORCYCLE LEATHER JACKET" is in sale since Wednesday, May 08, 2013.